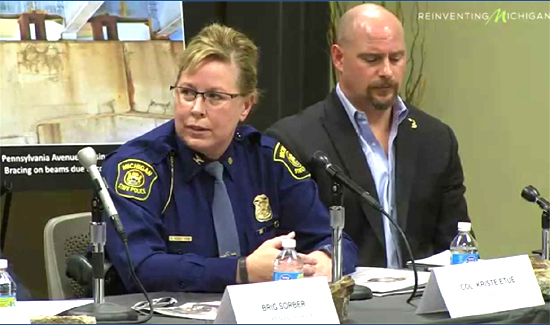 When she decides to retire, Michigan State Police chief Kriste Kibbey Etue will leave the force with more than a half-million dollars and a $141,300 annual pension, according to a state document obtained by The Detroit News in an open records request. Gov. Rick Snyder has refused to fire Etue after the controversial the post for which Etue apologized, and has already committed to reappointing her in February. But late last week he docked her five days pay for violating the state police’s social media policy — the most severe punishment allowed. “I’m talking about the troops on the street, they risk their lives every day. … When you’re an administrator, you fall in a whole different category,” Chirkun said. “You’re not down in the freeway ditches on an everyday basis. Pensions are antiquated and need to upgrade to current 401k and HSA accounts.